Stock # KE012587A, 6.7L Power Stroke V8 Turbo Diesel B20 Engine, Automatic, 23606 mi. 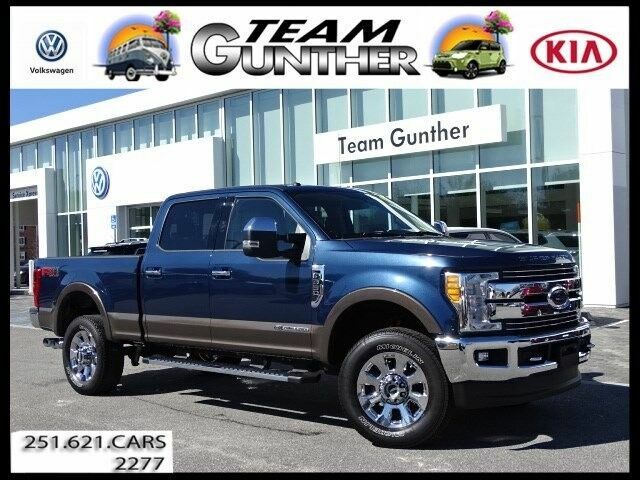 Contact Team Gunther Kia today for information on dozens of vehicles like this 2017 Ford Super Duty F-350 SRW Lariat. This Ford includes: 5" CHROME TUBULAR STEP BAR Running Boards/Side Steps 18K 5TH WHEEL HITCH KIT (PRE-INSTALLED) CHROME PACKAGE Chrome Wheels Running Boards/Side Steps *Note - For third party subscriptions or services, please contact the dealer for more information. * This vehicle is loaded with great features, plus it comes with the CARFAX BuyBack Guarantee. This Ford Super Duty F-350 SRW Lariat is for the discerning driver who demands the utmost of his vehicle. When Ford created this vehicle with 4 wheel drive, they immediately enhanced the performance ability. Easily switch between two and four wheel drive to take advantage of the improved steering and superior acceleration. The Super Duty F-350 SRW Lariat is well maintained and has just 23,606mi. This low amount of miles makes this vehicle incomparable to the competition. Marked by excellent quality and features with unmistakable refined leather interior that added value and class to the Ford Super Duty F-350 SRW This impeccably built Ford Super Duty F-350 SRW Lariat comes with a plethora of added features that have made this vehicle a unique find. These options will simply amplify the experience of owning and driving this wonderfully crafted Ford. Team Gunther Kia is honored to present a wonderful example of pure vehicle design... this 2017 Ford Super Duty F-350 SRW Lariat only has 23,597mi on it and could potentially be the vehicle of your dreams! Excellence, luxury and stature are just a few of the pillars this car is built upon. Handle any terrain with ease thanks to this grippy 4WD. Whether you're on a slick pavement or exploring the back country, you'll be able to do it with confidence. This 2017 Ford Super Duty F-350 SRW has such low mileage it has been parked more than driven. This is about the time when you're saying it is too good to be true, and let us be the one's to tell you, it is absolutely true.